AMD is getting ready to fight back against Nvidia’s powerhouse GeForce RTX graphics cards, preparing some impressive GPUs to be launched in 2019. At least that’s what the company’s chief executive asserts – as is her job, naturally – with Lisa Su making some interesting comments on a recent conference call, as highlighted by Wccftech. She was also drawn to make comments on ray tracing, which is hardly surprising seeing as this is what Nvidia is busy pushing with its new GeForce RTX range. In other words, AMD will be ready when ray tracing is ready – ready for a mainstream market, that is. From what we’ve seen thus far, Nvidia’s ray tracing technology cuts frame rates massively, even with powerful hardware. A case in point: our Battlefield V benchmarks with a GeForce RTX 2080 Ti, even at Full HD resolution, show that the frame rate is halved even with ray tracing on low (and cut by almost two-thirds on ultra). That said, Nvidia has just promised some big gains – to the tune of up to 50% – coming to Battlefield V initially thanks to the refinement of the technology, including the use of a new trick called variable rate ray tracing that allows for much more optimal performance. And further progress on this front is promised, presumably with other games, too. 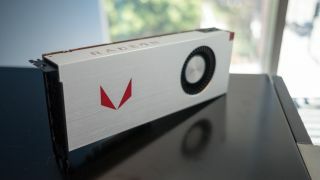 At any rate, AMD clearly believes that its incoming 7nm-based graphics cards are poised to be highly competitive, and importantly, not just at the more wallet-friendly end of the market, but at the top-end against Nvidia’s mighty (and mightily expensive) RTX range (the just-revealed Titan RTX in particular costs an eye-watering $2,499 – around £2,000, AU$3,400). Fingers firmly crossed that this isn’t just bluster from AMD, as obviously it’s good news for everyone to have a competitive marketplace in terms of helping to tame any excesses of GPU pricing.